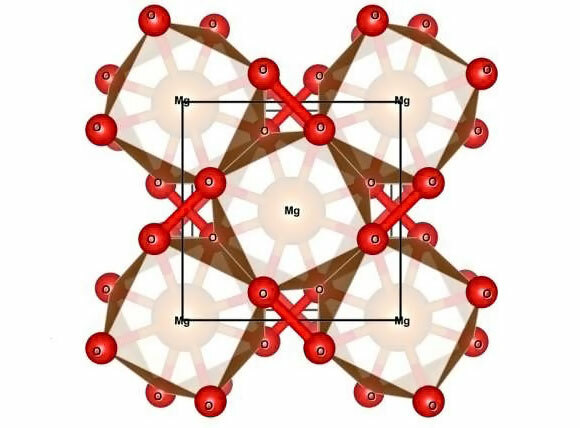 The crystal structure of magnesium peroxide, MgO2, courtesy of Sergey Lobanov, created using K. Momma’s program for drawing crystal structures. New research suggests that magnesium peroxide may be abundant in extremely oxidized mantles and cores of rocky planets outside our Solar System. Washington, DC — As astronomers continue finding new rocky planets around distant stars, high-pressure physicists are considering what the interiors of those planets might be like and how their chemistry could differ from that found on Earth. New work from a team including three Carnegie scientists demonstrates that different magnesium compounds could be abundant inside other planets as compared to Earth. Their work is published by Scientific Reports. Because of its chemical inertness, MgO has also long been used as a conductor that transmits heat and pressure to an experimental sample. “But this new information about its chemical reactivity under high pressure means that such experimental uses of MgO need to be revised, because this very stable at ambient conditions material could be creating unwanted reactions at high pressures,” Goncharov added. Be the first to comment on "The Interior Chemistry of Distant Planet’s May Differ from Earth"